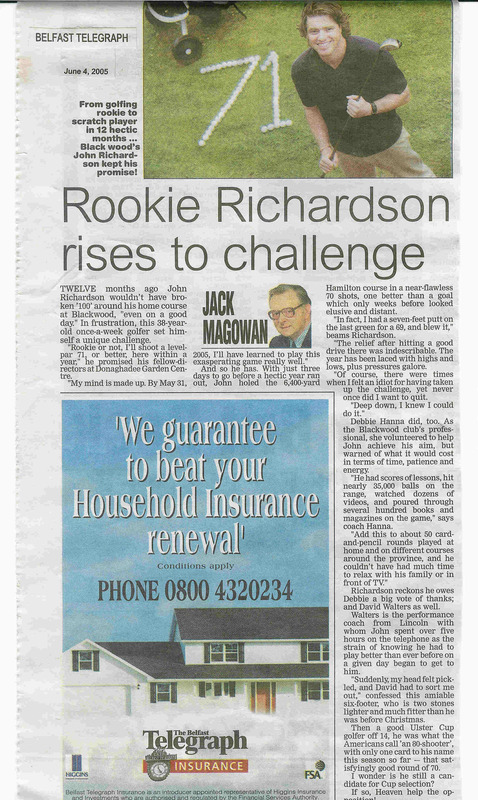 My name is John Richardson – I’m a 39 year old golfer who lives in Northern Ireland. In May 2004 I set myself a challenge. I was a hacker golfer who couldn’t break 100 and I decided I wanted to break par at my local course at Blackwood Golf Centre. And I was going to do it in a year or less. During the year the great and the good told me that it wasn’t possible. Sam Torrance told me to “dream on”, Darren Clarke told me that three years would be the minimum time I would expect to be able to do it in and countless experienced golfers scoffed at my chances. But 363 days later, I completed a one under par round of 70 at Blackwood. It was a year of madness and mayhem. I hit more than 35,000 golf balls hit, read at least 60 books and watched dozens of instructional videos late into the night. I encountered some amazingly helpful characters along the way and even managed to stay married during the process! 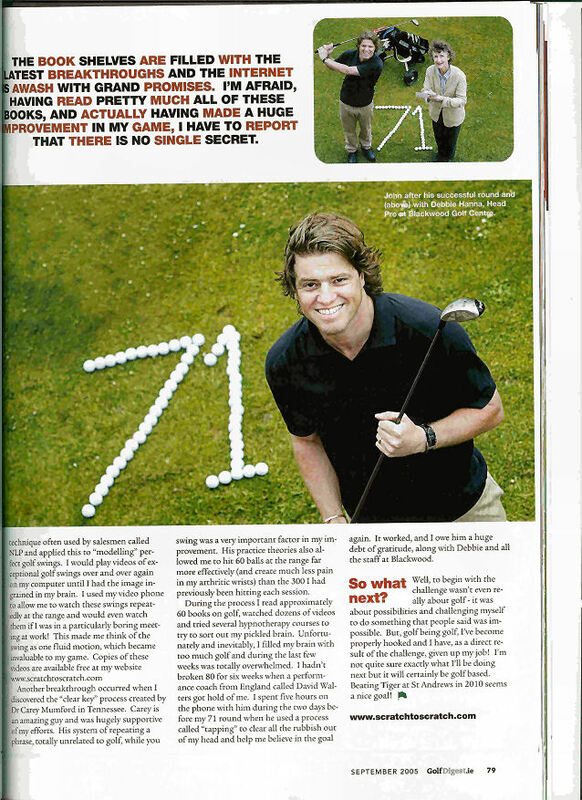 The challenge was recorded in a monthly column in Golf Digest Ireland and nearly all the UK magazines carried articles on me with a full page spread in Today’s Golfer. Since then I’ve written a book on the challenge “Dream On – The challenge to break par” which will be published worldwide later this year. If you want the first three chapters (and a couple of freebies) just send an email to tjohnrichardson@gmail.com and I’ll get them off to you. Please visit http://www.scratchtoscratch.com for the secret I unearthed which gave me my first big breakthrough. This blog is about my comments on the world of golf. It’s where I show what I learned and how it relates to the pros. Preview chapters were great reading. I look forward to the rest. I have checked out the first few chapters and they are great. Where/when will the book be on sale in Scotland. Please send 1st 3 chapters. Hi I cant seem to find your book anywhere? Has it been completed? If so I am really excited about purchasing it as I am throughly enjoying your blog. You’re definitely an example for all golfers. You took a challenge, worked hard and finally succeed. I’m sure you got the same clubs from the beginning to the end of your crazy year, not finding excuses for bad results in a material problem. Too many golfers seen on the practice range prefer spending thousands of dollars in a driver and high quality balls instead of taking regularly lessons with a pro and really improve their game. I had a back injury last summer and couldn’t play full swing for more than 2 months. Was it an excuse for wasting my time watching TV and complaining about my back? No, I spent hours and days improving my chip&putt game. Your example will definitely be kept in my mind for the coming seasons and a motivation for hard work on the practice range. WHERE I CAN BUY YOUR ENTIRE BOOK??? PLEASE LET ME KNOW. 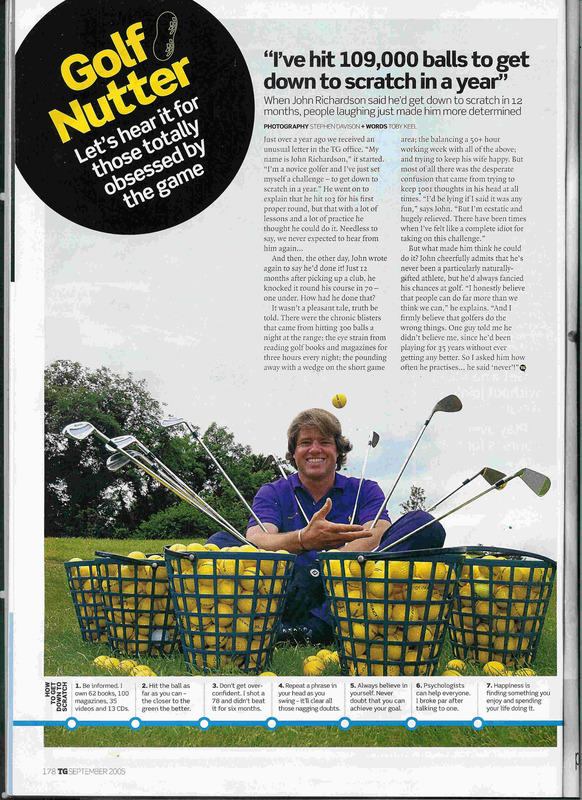 I have just read with great intrest the article about your challenge in todays golfer. my name is david and i am a 45 year golfer I too have set my own challenge! i have been a scratch golfer, but 2 years ago i contracted MS. After my 1st attack i was left enable to walk for 3 months. after building myself up i managed a few holes, then progressed to a full round after a few months. i had my handicap reassesed and was given a handicap of 10. I still had problems breaking 90 because my swing was shall we say was individaul before i got ill. i had to change to a more technically correct swing to enable to play again. after finding a excellent coach i have made progress to the point that i shot a pair of 75s in our club championship last year coming 2nd. (i was baeten by 1 shot). this reduced my handiacap to 8. Well here is my challenge. (set by my partner nikki she has been my rock when i was told i would never play again, she gave me the support and courage to try again).Anyway my challenge is to get down to 1/scratch in 5 years so i can try to qualify for the British seniors open as an amatuer. like you i have been told this is impossible, many reasons are given from my disiabilty to no one can get that good with so many problems. But i belive i can do this, i can no longer work full time so have many oppertunites to practice and play! I cant hit thousands of balls a week but do practice short game a lot. After reading your article i have now a added zeal to do this to show myself and all the doubters that have been holding me back recently that it can be done. I would love to read your book and pick your brain on how you achived your amazing feat. I would love to learn the mental keys you leant to maximise your practice time as i belive this is key to me completing my challenge. i would love you to contact me by e-mail to discuss this more!!!!! Many thanks for your insperation and look forward to hearing from you. Hi john, I’d be interested in the first three chapters of your book. Great achievement! 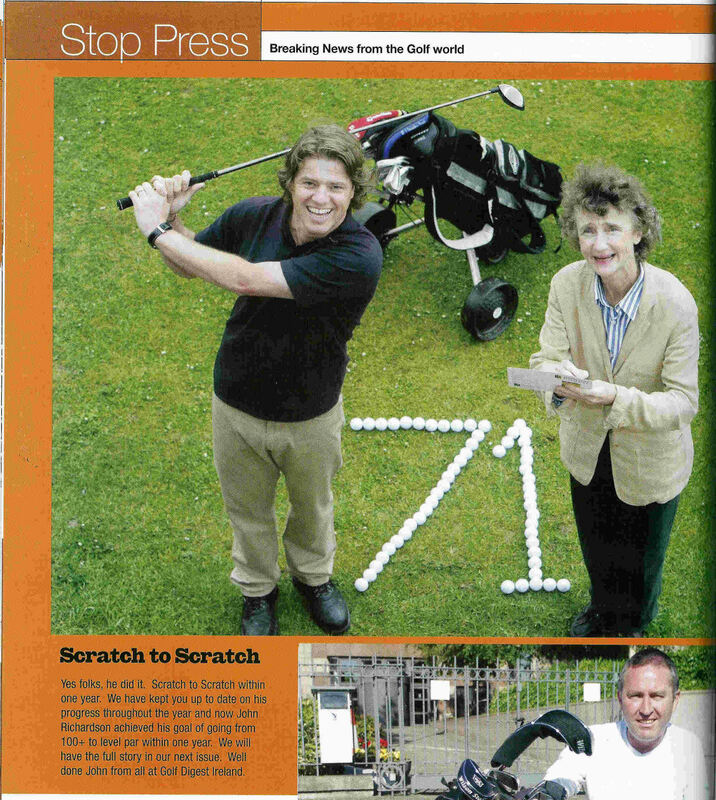 Hi John, have just read in Todays golfer about your amazing feat. Ive just started lessons after playing for a year and ive found that having to change everything from grip to posture has put my handicap back up from 23 to 27. 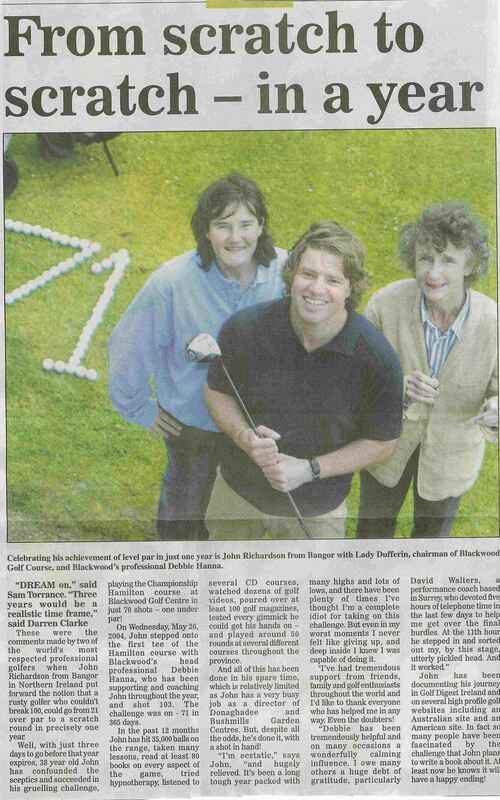 Hey john, loved reading your story in todays golfer. Congrats for achieving this great thing. Your story inspired me to work on my game more logically and so far i am noticing improvments. And whats better is i am noticing the faults also. A few days ago i shot an 88 which beat my previous best my 8 shots. Pretty pleased seenas i only played for 3 months. In your article it said you watched a recording of someones golf swing. I really wanted to check the guy out as i think its a great idea but can’t remember his name…. Just read your first 3 chapters and found them very motivational. Look forward to the rest when published. You are a true inspiration to golfer’s Mr Average of which I am one. I’m trying to get a hold of you. Can you drop me an email so I can get a contact email from you? CONGRATULATIONS! You certainly achieved a great goal, but you sure were committed! I’ve read your 12 lessons and they will give any golfer a fantastic opportunity to learn from the time you invested in this achievement to the benefit of their game. 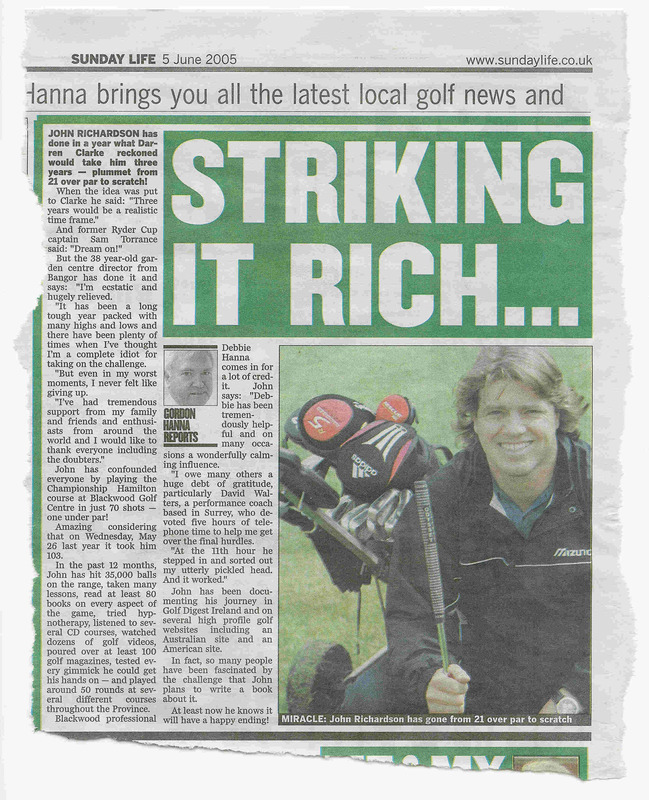 I would like to make personal contact with you as I’m the author of ‘Golf Swing Eureka!’ (http://www.golfswingeureka.com) and would be interested in sharing some thoughts with you. If you could drop me an email that would be great. I’m friends with both Mike Pedersen and Andy Brown. HI john a very well done.Please can you tell me where to get your book from and what it is called.thanks,regards steve. well done. you are an inspiration to all golfers. in addition to the book, i suggest you make top 50 tips on cards for us to tear and use. i need the picture of george best. John I have read this absorbing tale in one sitting and must say it is a story many golfers including myself would like to aspire to.But its more than just golf Simply outstanding. Have you a number that i could contact you on? Seve…..you’ve guessed it, the perfect chip. I recommend your book to others. Very entertaining and thought-provoking. Beeing honest: I do admire you for your even par round. So far my best HCP was 34 and mostly I play not a Professionel Average but a Hacker Av. Result 😉 When I read your chapter “Hummer and Champagne” I felt that I will try as well. Not to get an even par round but a HCP 20 in the end of next year… So far that sounds – after many questions to myself having giving answers as well – more than possible 😉 Wow, it is fantastic what you did and be greatful for such a woman you have. Do you think it’s possible play on tour? At least in web.com tour? If somebody can do the same?